In the early 1980’s the search was on for what astronomers called Nemesis, a gravity draw beyond the solar system out in the direction of the constellation Orion. This gravity draw had been noted for centuries to be perturbing the outer planets. This search was reported in Astronomy magazine, the New York Times, Newsweek, and US News World Report. The search resulted in a front page article on the Washington Post on December 31, 1983, announcing a discovery. 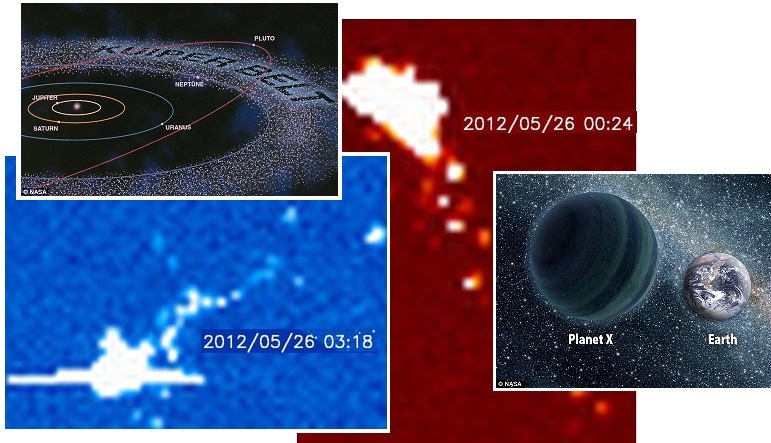 Planet X, aka Nibiru, had been sighted, inbound, by a US government infrared balloon lofted above the atmosphere. The pull exerted by its gravity would account for a wobble in Uranus' orbit that was first detected in 1821. Astronomers at the U.S. Naval Observatory (USNO) are using a powerful computer to identify the best target zones, and a telescopic search will follow soon after. Van Flandern thinks the tenth planet may have between two and five Earth masses and lie 50 to 100 astronomical units from the Sun. Scientists at the space agency's Ames Research Center said the two spacecraft, Pioneer 10 and 11, which are already farther into space than any other man-made object, might add to knowledge of a mysterious object believed to be beyond the solar system's outermost known planets. Newsweek: Does the Sun Have a Dark Companion? A heavenly body possibly as large as the giant planet Jupiter and possibly so close to Earth that it would be part of this solar system has been found in the direction of the constellation Orion by an orbiting telescope aboard the U.S. infrared astronomical satellite. So mysterious is the object that astronomers do not know if it is a planet, a giant comet, a nearby "protostar" that never got hot enough to become a star, a distant galaxy so young that it is still in the process of forming its first stars or a galaxy so shrouded in dust that none of the light cast by its stars ever gets through. So close in fact that it would be the nearest heavenly body to Earth beyond the outermost planet Pluto. The mystery body was seen twice by the infrared satellite as it scanned the northern sky. US News World Report: Planet X - Is It Really Out There? At that time, in the early 1980’s there was some openness about the search for Nemesis, a diagram that appeared in the 1987 New Science and Invention Encyclopedia published by H.S. Stuttman, Westport, Connecticut, USA even showing the path of the Pioneer 10 and 11 probes in relationship to the mystery body they were sent to probe. Then the cover-up over Planet X dropped like a cloak of darkness. It never happened! There were no perturbations, just mathematical errors! Now in May, 2012 Nemesis is being revived! Brought back from the dead! But notice they do not mention the search in the early 1980’s and the discovery of Planet X in 1983! And they certainly do not mention the body showing up regularly on SOHO and Stereo images, and being photographed by people all over the world using the red filter inserts from old floppy discs, or what showed up during the last lunar eclipse on May 20-21, 2012. Per the Zetas, the establishment is formulating an explanation for the day when (horrors!) the populace notices Planet X and its many Moon Swirls in the sky above them, and it is not yet time for the elite to dash to their bunkers or declare martial law! What to do! Quick, pretend it just arrived! Is that why the 1980’s Nemesis search is being omitted, so the establishment is not constrained by direction? Remember, for centuries, the outer planets were perturbed toward Orion, and this is where it came from in 2003. Accept no substitutes! Is 'Planet X 2.0' Lurking Beyond Pluto's Orbit? Before the doomsayers hijacked "Planet X" and used it as a phantom (a.k.a. "Nibiru") to scare people into believing the 2012 doomsday hype, the hunt for Planet X was an exciting astronomical quest to find a hypothetical world in the outermost reaches of the solar system in the early 20th century. Although the presence of a massive planet may explain the extreme orbits, there is little else that suggests Planet X 2.0 really is out there. But the method of seeking out other worlds while looking for their gravitational influence on the orbits of other celestial bodies has been done before, with historic success. ZetaTalk Explanation 6/2/2012: NASA’s history of discovery on wandering rogue planets that seem to travel through space independent of a central Sun is not a pretty one. Similar to the Flat Earth theory, they clung to their theories righteously, angrily attacking the facts and any messenger bringing them those facts as though their egos were a holy place and the truth were the enemy. When ZetaTalk presented concepts that explained the behavior of such rogue or traveling planets, their failure to follow a circular orbit around a sun and the speed at which they can move through space, Nancy and ourselves were ridiculed for not understanding “the laws” of nature as purported by their God Newton. When it became obvious that Planet X was zooming into the solar system, at the speed we had predicted, the establishment realized they would likely have to invent an excuse in case the passage was not swift. What if a body were visible, for months or years, so the public became restless and rebellious? While frantically ridiculing Nancy and ourselves, they had their cover-up minions purport that Planet X was “out past Jupiter”, and spread rumors of spots that Google Sky would not display. All the while, of course, Planet X and its Moon Swirls were showing up on SOHO and Stereo images, seen naked eye, and recently made a nice appearance during the May 20-21 lunar eclipse. Should Planet X itself suddenly become visible to all, they will announce that the suspected nemesis body at the fringes of the solar system moved to explain its rapid arrival! Drones are increasingly being used by the US and Israeli military, which is increasingly worrying civil rights groups. Drones have historically been used to gather intel, an overhead camera in effect, but now are increasingly being used as a substitute for armed war planes or boots on the ground. Highly mobile remotely controlled drones are being armed and being authorized by the FAA to fly over cities. Their largest use is within military applications. 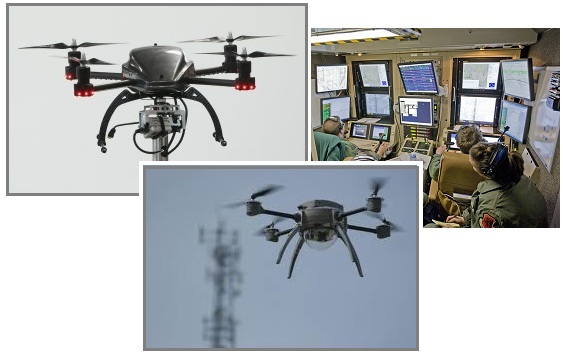 UAVs are also used in a small but growing number of civil applications, such as firefighting or nonmilitary security work, such as surveillance of pipelines. UAVs are often preferred for missions that are too "dull, dirty, or dangerous" for manned aircraft. The earliest attempt at a powered unmanned aerial vehicle was A. M. Low's "Aerial Target" of 1916. Nikola Tesla described a fleet of unmanned aerial combat vehicles in 1915. Per the Zetas, drones are likely to be used by the elite to control the masses going into and after the Pole Shift, but surprises wait. ZetaTalk Prediction 5/5/2012: The US government is fast putting drones into operation over their cities. The reason is obvious – they know what is coming. How drones are used in the future is up to the hands that manage them, in the hands of man, and thus it is difficult to predict the outcome. It is hard to imagine drones being used as a peaceful assist to citizen survival. Would the drones track ahead of a group of migrants, looking for broken bridges or gangs laying in wait in the bushes? Or would drones be used to guard the perimeter of a large survival camp, so that woman and children could tend flocks and herds and garden in the fields with safety? There is, of course, this possibility, but the more likely possibility is that wealthy enclaves would be protected in this manner, and drones used to ensure that a slave labor force remain in the fields and not manage to escape. An example of how easily drones can be tampered with, by benign aliens, is this example of a persistent computer virus afflicting US military drone fleets used in Afghanistan. The virus would be eradicated, and then reappear! Per the Zetas, this was a warning. A computer virus has infected the cockpits of America’s Predator and Reaper drones, logging pilots’ every keystroke as they remotely fly missions over Afghanistan and other warzones. The virus, first detected nearly two weeks ago by the military’s Host-Based Security System, has not prevented pilots at Creech Air Force Base in Nevada from flying their missions overseas. Nor have there been any confirmed incidents of classified information being lost or sent to an outside source. But the virus has resisted multiple efforts to remove it from Creech’s computers, network security specialists say. And the infection underscores the ongoing security risks in what has become the U.S. military’s most important weapons system. ZetaTalk Explanation 10/22/2011: As is well known, at least among contactees, is our many means of maneuvering in human society. Screen memories, temporary future travel to affect a future scene that will click in when the time arrives, and temporarily freezing all in a room so a maneuver can occur are some means we have explained. The virus is reinstated after removal, deliberately. The drone virus is a warning of potential future interference if the drones are used by the establishment to enforce slavery of survivors, or track migration of survivors after the pole shift. The much touted end of the Mayan Calendar – December 21, 2012 – was promoted by the establishment because at the time the date was far in the future. “Not to worry”, was their message to the working men and women of the Earth, ”there’s plenty of time”! Just go to your jobs and keep paying your taxes. But as the year arrived, the establishment became nervous. After all the hype, how to keep the working folk focused on their jobs? Might they panic? The solution was to begin murmuring that December 21, 2012 was not, after all, any kind of firm date! Just as the Zetas warned they would do. ZetaTalk Comment 11/26/2011: 2012 was used as a magnet, so that discussions about the many prophecies, the End Time prophecies, could be pointed into the future. When the 2012 craze first began, years ago, this was far into the future and thus considered safe by the establishment, who want first and foremost for their slave classes to tend to their jobs and not rush away from coastal cities. Where ZetaTalk was saying mankind should prepare now, move to their safe locations now, the establishment wanted the common man to think they had plenty of time to prepare. What will they do now that 2012 is upon them, and we are only at the start of the 7 of 10 scenarios? They will fog the issues, finding some reason to point into the future. Now that message is being pushed. Suddenly, information from the Mayans that was there all along has become available, just now receiving press coverage. Archaeologists have found a stunning array of 1,200-year-old Maya paintings in a room that appears to have been a workshop for calendar scribes and priests, with numerical markings on the wall that denote intervals of time well beyond the controversial cycle that runs out this December. For years, prophets of doom have been saying that we're in for an apocalypse on Dec. 21, 2012, because that marks the end of the Maya "Long Count" calendar, which was based on a cycle of 13 intervals known as "baktuns," each lasting 144,000 days. But the researchers behind the latest find, detailed in the journal Science and an upcoming issue of National Geographic, say the writing on the wall runs counter to that bogus belief. 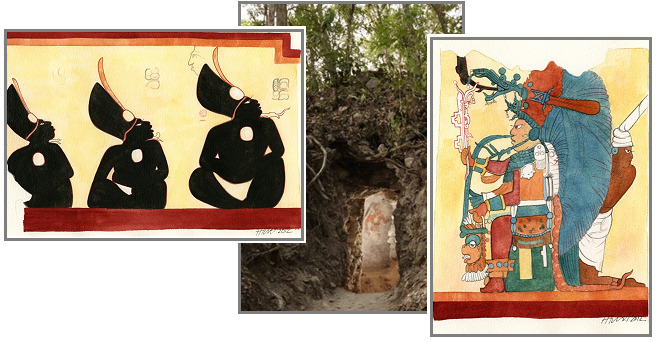 Archaeologists have been trying to get out the word that the end of the Maya culture's 13-baktun "Long Count" calendar didn't signify the end of the world, but merely a turnover to the next cycle in a potentially infinite series. As the 7 of 10 S American roll progresses, the top of S America is pulled westward over the Cocos Plate while the spine of the Andes down to the latitude of Buenos Aires is held back by the Nazca Plate. This causes S America below Buenos Aires to bend, stretching the east coast so the land drops. This has been recently been shown by dramatic flooding just to the southwest of Buenos Aires. The seaway at Buenos Aires is expected to rip open during the Pole Shift, but in the mean time, the stretch from the 7 of 10 bending is pulling the lands in nearby Pehuajó down, as detailed in a Pole Shift ning blog. 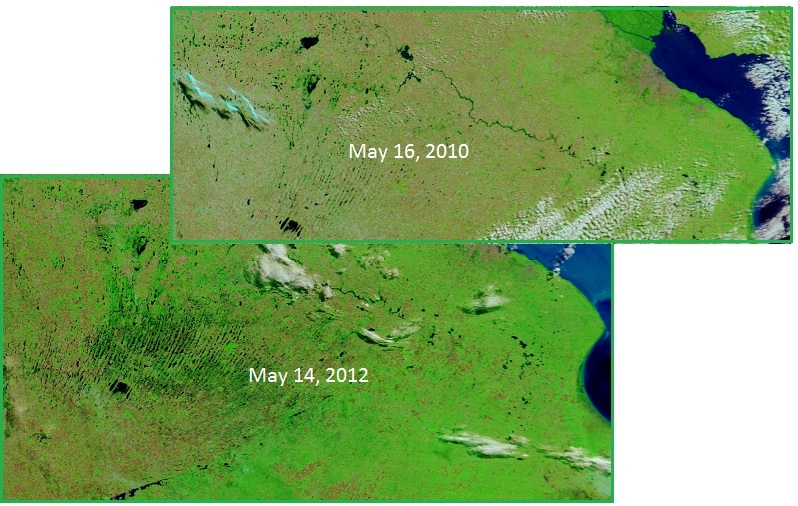 Satellite images show that Pehuajó is flooded, despite a lack of rain and being inland from the coast. The manager of the Rural Society of Pehuajó details that the party has 450 000 hectares and employs more than a thousand producers. 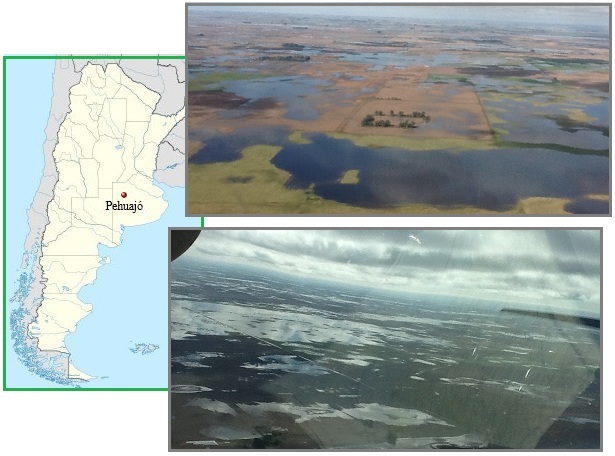 "80% is under water, most are not finished harvesting corn and soybeans and that did it can not move"
In total, the number of hectares affected by floods in northwestern Buenos Aires would reach 1.1 million.